Thailand is always worth a visit! Even if you just make a stop over from or to another Asian destination, it’s well worth considering a few days break here. The capital, Bangkok, offers pure life, colours, culture, tasty restaurants and little food shops, bars and massage saloons and three different railway systems. The transport systems are well worth exploring. The state railway is a metre gauge system while the Skytrain and the Airportlink are electrified standard gauge lines. Bangkok has an underground metro as well. Besides these, you’ll find railway museums and plinthed locomotives. However, the main reason we’re going here is the king’s birthday special train to Ayutthaya, which is usually steam hauled. 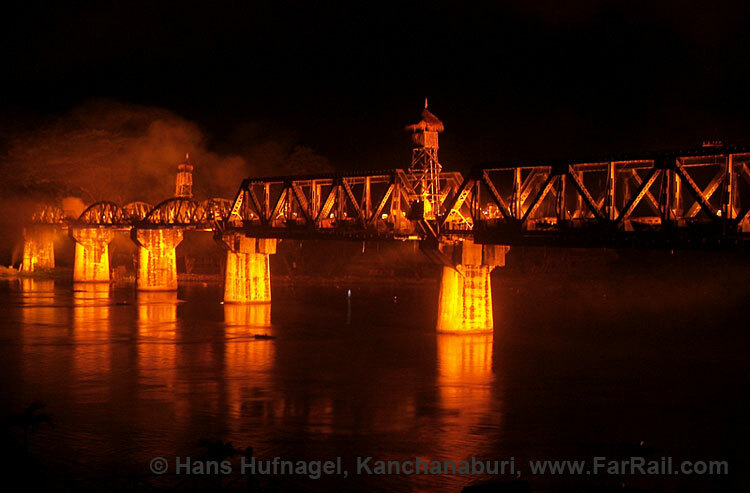 Also we’ll visit the nocturnal spectacle at the river Kwai bridge in Kanchanaburi. If we’re lucky we’ll see there one of the Japanese-built C56 in steam. The King is held in great respect and each of his birthdays is celebrated by the whole nation. A part of the activities is a special train from Hualumpong to Ayutthaya. By charter bus we’ll try to get at least one reasonably good picture of the special train. 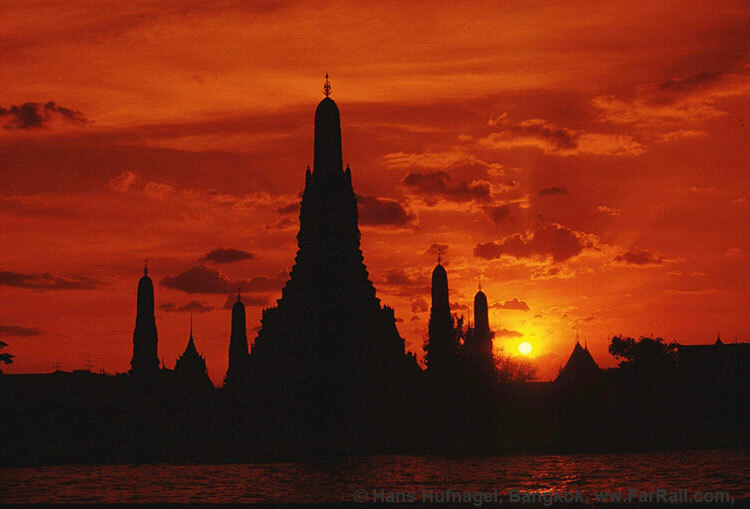 In Ayutthaya we’ll visit some of the most important temples. Early afternoon we return to Bangkok and visit the railway museum in the Chatuchak Park (subject of admission). Alternatively you may return to Bangkok by the King’s special train. Hotel in Bangkok. Return flight home or continue to our winter steam in China tour. Depending on your chosen flight arrival in Europe either the same day or the next morning. The serviceable steam locomotives in Thailand are used exclusively for special events like the King’s birthday train and the River Kwai festival. After several years of negotiations with the authorities we have to admit that it is impossible to arrange steam hauled charter trains. So we’ll take what we can get, therefore we’ll visit Thailand when there are steam locomotives around. The king’s birthday train goes over a flat line with only a few reasonable positions. Its two locomotives will be coupled tender to tender. Good pictures are possible in the depot, where the steam locos will be prepared for their rare services. A permit for such a depot visit usually arrives just a few days before our group, although we’ll requested the paper many months in advance, but it’s likely that it will be worthwhile and interesting. The railway museum is privately owned and is not open on a regular basis. Even with an official registration it’s possible to find a closed door. So we have planned an alternative visit to the technical museum at Ekkamai. We will also try to catch some regular service activities on Thai Railways around Bangkok. They operate an interesting array of diesels, some of them quite elderly. The River Kwai festival is well worth a visit, even if the steam loco passes over the bridge only in the darkness. The locomotive is simmering in the station the full day just doing nothing. In the worst case there is no steam locomotive in steam at all. The history of the River Kwai bridge is well known already, but before the trip it is worth reading again, or watching the movie classic Bridge on the River Kwai. Anyhow, the spectacle in the evening is an impressive show. Certainly we’ll get a nice picture of one of the diesel hauled trains on the trestlework bridges. Our Thailand programme offers an inside view of the current opportunities for seeing steam locomotives in service. Unfortunately, currently no more is possible, but the engines are in excellent external condition and are very carefully maintained, so seeing them is well worth the effort. During WW II Japanese invaders wanted to conquer India. Because the sea access was blocked by the allied forces they searched for an alternative route over ground. The Japanese found the railway connection from Singapore via Bangkok to Moulmein and Rangoon suitable. Large parts of this railway link existed already, but the missing part between Nong Pladuk in Thailand and Moulmein in Burma was the most challenging part through the malaria infected forests and over mountains. 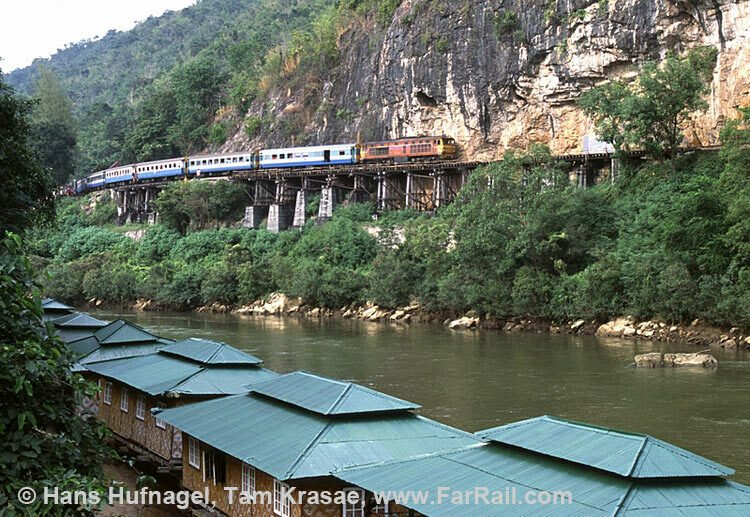 On its way, the line needed a bridge over the now famous River Kwai. Today, this bridge is only partly original because the US Air Force destroyed it in October 1945. The construction of the railway from Jun 1942 cost about 84,000 lives, mainly prisoners of war. For that reason, it’s called the death railway. Today you find only the part up to Nam Tok in use. Further on, they’ve cleared the embankment for about three miles. This section is a tourist path through the “Hellfire Pass“. Between 1901 and 1904 the Meklong Railway was built by the Tha Chin Railway Co.Ltd. as a suburb railway. On June 10th, 1905 it was taken over by the newly established Mae Klong Railway Co. Ltd. 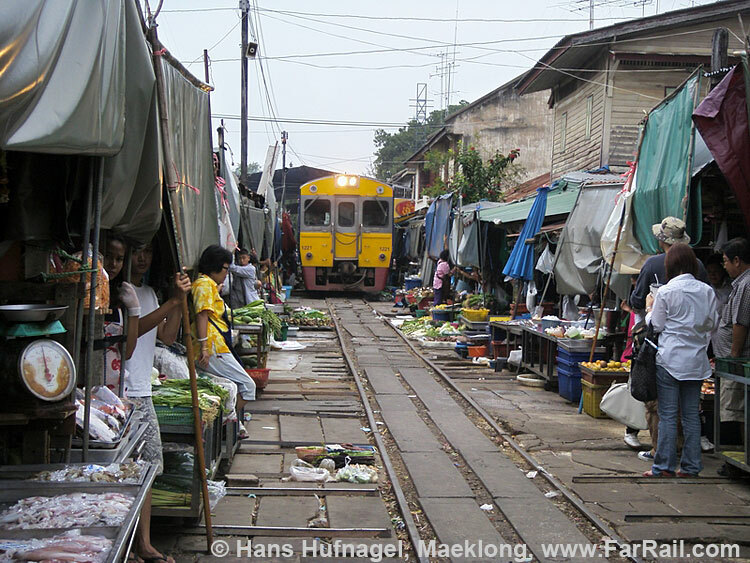 The line went from the station Ban Laem (Samut Sakhon) on the other side of the Maenam Tha Chin river to the Maenam Mae Klong (Samut Songkhram, formerly named Maeklong) and terminated in the station Meklong. The line is some 34 km long. Because the investors wouldn’t build a bridge over the Mae Nam Ta Chin , passengers needed to use a ferry from Mahachai to Tha Chalom to get to Ban Laem by rail. Even today there is still no bridge, so it’s the ferry which links the railway. 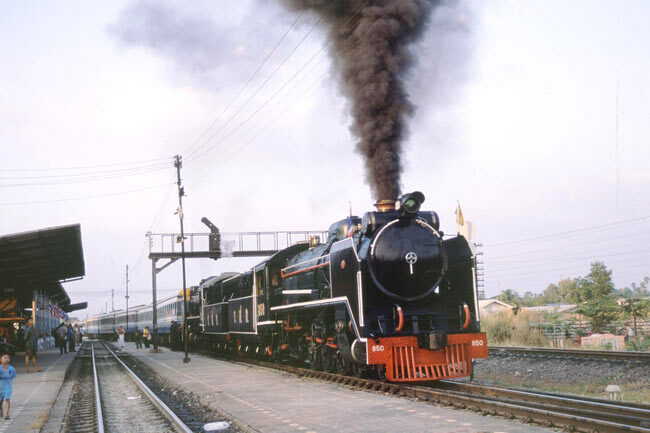 After 1945 the railway was nationalized and became a part of the Royal State Railway Department. Just before it reaches its terminus it runs through a tight market. The marked stalls must be removed from the rails just before a railcar passes the scene. After it has passed the market quickly recovers and uses every available space  including the tracks. General information about Thailand and Bangkok is available easily and hence will not be repeated here. In Bangkok there is no malaria risk. On our tour we’ll hardly be affected by any tropical diseases and just in case there are lots of excellent educated and English speaking medical doctors available. In the shopping centres of the country you’ll find everything you need  and everything almost no-one needs. Electricity is compatible to European standard (220 Volt, 50 Hz), but sometimes you need an adapter for the sockets. Power cuts are rare. During our stay in Thailand we’ll use public transport several times which gives you a good chance to get involved in the day to day life of the Thais. With the exception of breakfasts, we haven’t arranged any meals. It’s so simple to find good restaurants with tasty food to suit every taste, at least in Bangkok. Charter buses and trains represent the standard of our host country, which may deviate from European or North American expectations. The itinerary is designed especially for photographers and video filmmakers. Please keep in mind that the steam events in Thailand cannot be influenced by us. 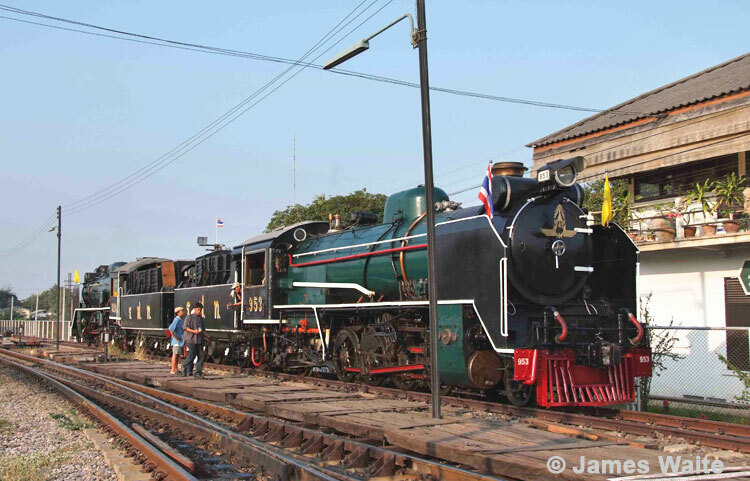 We’re taking part in one of the rare occasions that Thailand’s steam locomotives are used. You can’t charter them - we’ve tried already. Therefore we are not able to guarantee that any of the announced trains will run or will be steam hauled. You must remember that officials can cancel the event for any reason. When we see steam activities, they are by chance, not by arrangement. In the unlikely case the birthday specials don’t run, we’ll offer tours with the different public transport systems in Bangkok (Skytrain, Airportlink, Metro), visits to the main station of Bangkok, visit to plinthed locomotives in Bangkok and along the death railway and time to explore the tourist highlights of Bangkok (there are quite a lot). Hygienic and environmental standards in Thailand do not conform to European or North American expectations. Carrying some toiletries in your photo bag is hence advisable. Please bear in mind that transport in Thailand falls short of EU/US safety standards. Always use common sense when crossing roads and railway tracks. FarRail Tours cannot be held responsible and will not accept any liability whatsoever in the case of any accident or damage. We suggest you take out a comprehensive overseas accident and health insurance policy. As a service to our UK-based clients FarRail Tours accepts and will continue to accept payments made out in Pound Sterling until further notice. However, please note that all prices quoted in Pound Sterling are indicative only and are subject to change without prior notice. This measure was taken by FarRail Tours due to the unprecedented volatility in the international foreign exchange markets and its impact on the valuation of the Pound Sterling versus other major currencies, namely the Euro as FarRail Tours' accounting currency.